Gourmands and gastronomes are in for a real treat aboard this boutique barge! Owned and operated by Captain Tim Harrold, the Randle offers terrific value for casual travelers seeking an authentic dining experience. 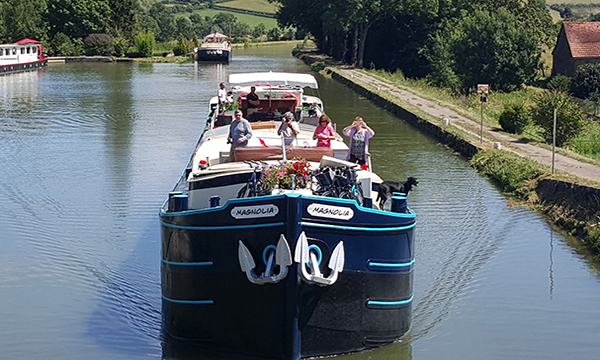 Offering an immersive experience for casual travelers interested in an authentic dining experience, along with an introduction the delightful Burgundian countryside, Tim has been welcoming guests aboard the Randle since 2005. He brings to the Randle a background in hospitality, sailing, construction, and restoration of ancient buildings. Chef Gael, a longtime crew member, comes in daily to serve Continental breakfasts and sumptuous buffet lunches. Furthering the Randle’s dining program of distinction, all dinners are enjoyed ashore, at the expense of the guests, at a selection of venues ranging from Michelin starred auberges to informal bistros. Captain Tim makes the dinner reservations and provides transportation to and from the dining venues. Back on board, the wheelhouse functions as a both salon and dining room, with breakfast and lunch taken at a comfortable round table. Down below is a small lounge and open kitchen, perfect for visiting with Chef Gael, perhaps while enjoying a glass of the local Chablis. Two charming staterooms hold up to four guests; one of them even features a darling bunk bed, making this this cabin configuration an ideal option for families with children, or more casual travelers. Beautiful walking and bicycling along the miles of manicured towpath is a treat for active passengers, while those wishing to relax are always welcome to just watch the beautiful scenery float by. Captain Tim serves as a lovely and attentive host, functioning as a trusted resource to the many facets of Burgundy, including activities, architecture, and attractions. In the afternoon, you will be met by a Randle crew member at the designated meeting point. From here, relax as you are chauffeured to the Randle, moored in the town of Chevroches. A traditional Champagne welcome and introduction to the crew awaits you. Visit the nearby town of Clamecy and stroll through the cobblestoned streets before tonight's dinner, taken ashore at Hostellerie de le Poste, at your expense. A morning cruise provides the perfect opportunity to explore the towpath with a gentle pedal or a leisurely stroll. Today's excursion is to the hilltop town of Vezelay, one of Burgundy’s beloved treasures. Both Vezelay and its 11th century Romanesque Basilica of St Magdalene are designated UNESCO World Heritage sites; Vezelay Abbey was also a starting point for pilgrims on the Way of St. James to Santiago de Compostela. After your tour, browse the village's shops and boutiques. Tonight's gourmet dinner is served onboard. Your day begins with a leisurely cruise, mooring beneath the stunning cliffs of Le Saussois. Active guests can hike up to the top for am expansive view of the surrounding countryside. Your Tour Guide will then chauffeur you to Grottes d’Arcy-sur-Cure, an illuminated labyrinth of ancient caves. A guided tour deep within the cave reveals carefully preserved Paleolithic paintings from 28,000 years ago. Return to the barge to freshen up. Enjoy your dinner ashore, at your expense, at the nearby l'étape-des-Gourmets or Chateau Vault-de-Lugny. This morning, your Tour Guide accompanies you on a morning visit to a local market in the medieval village of Noyers. A study of modern life thriving within 15th century medieval architecture, Noyers has been designated as one of the prettiest towns in France. Taste locally made cheese, discover the old ramparts, and admire the intact half-timbered buildings. Return to the Randle for lunch, and an afternoon cruise. Tonight’s dinner, at your expense, is enjoyed at the nearby Hostellerie de la Fontaine. During your morning cruise, relax in the Randle's petite foredeck, or explore the towpath by bicycle or on foot. Your Tour Guide escorts you today to area vineyards, where the grapes exclusively produce the white wine so treasured by oenophiles. Visit Irancy, Chitry, and/or Chablis to taste these iconic vintages. Grand Cru samplings can also be arranged, or sip the local sparkling wine, Cremant de Bourgogne. Tonight, enjoy dinner ashore, at your expense, at the nearby restaurant Auberge-les-Tilleuls. As the Randle glides along during this morning's cruise, enjoy a leisurely walk or a gentle pedal on the towpath. Located on the banks of the River Yonne, Auxerre was first settled by the Romans, and boasts a Cathedral, an Abbey, and a Church. Known for intact Medieval buildings, this is the ideal place to stroll along cobblestoned streets, browse the boutiques, or enjoy a cafe in the town square. Relax onboard in the afternoon. A celebratory dinner at La P’tite Beusaude, at your expense, completes your cruise. Please note: this is a sample itinerary which may be subject to change depending on local conditions. Route direction may alternate depending on previous direction run. Evening dining may be supplemented with an equal restaurant should for any unforeseen circumstance our chosen restaurant be unavailable. In the afternoon, you will be met by a Randle crew member at the designated meeting point. From here, relax as you are chauffeured to the Randle, moored in the town of Clamecy. A traditional champagne welcome and introduction to the crew awaits you, before your first dinner ashore. Choose from a selection of wonderful restaurants just a short stroll from Randle's mooring. Enjoy an all day cruise through the Burgundy countryside, stopping at the classic villages of Lucy-sur-Yonne and Le-Roches-Saussois en route. Stroll or cycle along the towpath, relax on deck, or take the electric motorboat up the smaller branches of the river. This evening, you will be chauffeured to the elegant dinner venue of Chateau Vault de Lugny, a 17th century chateau offering a fine dining experience. After breakfast onboard, your Tour Guide will take you on a one hour drive to the magnificent Chateau de Chailly for golf and lunch. Play 18 holes all afternoon on this majestic par 72 course set in the manicured grounds of the chateau’s beautiful parklands, surrounded by Burgundy's rustic vistas. Return to the Randle for cocktails and a gourmet dinner onboard prepared by Chef Gael, paired perfectly with Premier Cru wines of the region. After a morning cruise, your Tour Guide will accompany you to a market in the medieval village of Noyers. A study of modern life thriving within 15th century architecture, Noyers is considered one of France's prettiest towns. Taste artisan cheese, discover the village’s old ramparts, and admire the intact half-timbered buildings. This evening, dinner is ashore at the stately Hostellerie de la Poste, which has a lovely restaurant in what were the former stables of this ancient post house. After dinner, you will be chauffeured back to the Randle to retire for the evening. While the Randle cruises this morning, enjoy a bike ride along the towpath, or simply laze on deck to admire the scenery. After lunch, your Tour Guide will take you on a 40-minute drive to Roncemay, an 18-hole golf course within the manicured grounds a luxury domaine hotel. The course is spread out through forests, woods, and lush plateaus. Afterwards, your Tour Guide will chauffer you back to the Randle, where cocktails await, along with a gourmet dinner paired with the region’s Premier Cru wines. Today, your Tour Guide will accompany you to the Grand Cru vineyards of Chablis, followed by a special tasting in the village. Back onboard, the last cruise of the holiday ends in Auxerre, located on the banks of the River Yonne. Auxerre is known for intact Medieval buildings and is the ideal for strolling along cobblestoned streets, browsing boutiques, or enjoying a cafe in the square. What better way to cap the week than dinner at the Michelin starred L’Aspertule, which is a short walk from the mooring. Pricing supplement of $2,200 to the classic half-board cruise rate. Included: All breakfasts, five lunches and two dinners aboard the Randle; Greens fees, club rental, golf cart hire and lunch at Chateau-de-Chailly; Greens fees, club rental and golf cart hire at Roncemay; transfers between both courses and the barge. daily escorted excursions and use of on-board bicycles.